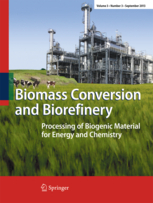 REGATEC has established a collaboration with the prestigious Biomass Conversion and Biorefinery Journal. 4 presentations at REGATEC 2014 will be selected and the corresponding authors will be encouraged to submit a full length paper to the journal. This entry was posted in News and tagged Biomass conversion, Biorefinery, Journal, REGATEC 2014 by jheld. Bookmark the permalink.